THIS IS WHAT YOU GET WHEN YOU LET POETRY OUT OF THE BAG. Words will pour, fall, trickle out of the mouths of tonight's performers, twisting words out of shape, cramming them into verses, spinning them into yarns. 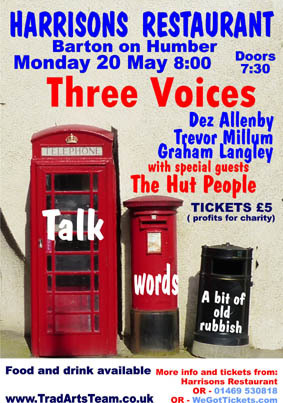 Poet Trevor Millum, storyteller Graham Langley and singer Dez Allenby are the THREE VOICES who will take language to depths of delight rarely experienced in this world or beyond. Let their words take you on a magical journey of nourishment and delight. They will be joined by THE HUT PEOPLE (Sam Pirt and Gary Hammond) who have firmly established themselves as one of THE most unique, entertaining and best-loved acts on the UK folk scene today. Come along to this great little restaurant in Barton, drink fine wine and nibble delicious delicacies while they feed your ears with words and your imaginations with dreams.